Two days ago, Israeli Prime Minister Benjamin Netanyahu and American President Donald Trump met in Washington for the first time since the latter was inaugurated. The greeting was done in a far warmer manner than similar meeting between Netanyahu and Trump’s predecessor Barack Obama. The two discussed a number of issues including relations between the two countries, the Iranian nuclear deal (which Trump deemed “one of the worst deals I’ve ever seen”) and Trump also politely told Netanyahu that he would “like to see you pull back on the settlements for a little bit” (see more). 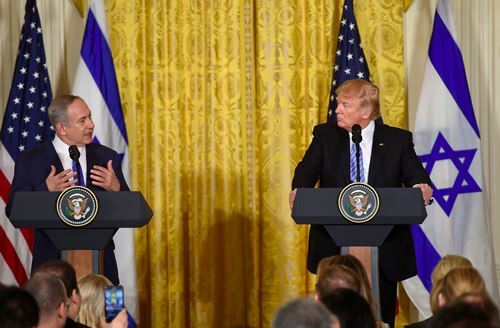 But the moment the conversation turned to the President’s views on a two-state solution, I had a feeling that this was going to be the main topic among commentators following the conference – and I was not wrong. In fact, Trump was non-committal and on many levels the statement was not deserving of the complete hysteria that has ensued. The concept of a two-state solution and the positions of both sides in the conflict are often misunderstood and indeed, misinterpreted. Notwithstanding, the reaction from the Palestinian side was unequivocal – Mahmoud Abbas, Saeb Erekat and Hanan Ashrawi were adamant that they were not prepared to accept Kerry’s concept that requires one of the states to be Jewish. In Ashrawi’s case, she was even prepared to accept Jewish peoplehood, claiming that Jews were a religion only and therefore not entitled to the right to nation self-determination which applies to all others including the claim of the Palestinians. In other words, the Palestinian side rejected out of hand Kerry’s vision of a two-state solution and in doing so repudiated this as a solution to the conflict. And yet, there was no reaction from the media, no headlines screaming that the PA was against the two-state solution. Nor have there been the merest of sound bites about Abbas’ statement that there was no room for a single Israeli in the Palestinian State. It seems therefore that the brouhaha about what Trump said was much ado about very little other than that he was trying to say that he wants to come to an agreement that both sides will agree upon. The peace-process has been at a stalemate for years, so perhaps a different tack is in fact needed. And perhaps the real message here is that both the Israelis and the Palestinians need to play a more active role in their future, and not have it continually dictated to by outside countries on the one hand, and by one-side resolutions and unilateral declarations in international bodies such as the United Nations. Indeed, the new US Ambassador to the UN Nikki Haley said, “We absolutely support a two-state solution… What we’re saying is, OK, let’s not just talk about the old way of doing things… Come to the table with all the fresh atmosphere and perspectives that we now have, and think, OK, what can we do knowing all of the factors, knowing where we sit present day, and how can we move forward”. What was most disappointing to me, at least in the way that this question was dealt with in the Australian media was that not one media focused on PM Netanyahu’s response to the same question, and it was an important one. The Israeli Prime Minister said, “rather than deal with labels, I want to deal with substance. It’s something I’ve hoped to do for years in a world that’s absolutely fixated on labels and not on substance. So here’s the substance: There are two prerequisites for peace that I laid out two years—several years ago, and they haven’t changed. “First, the Palestinians must recognise the Jewish state. They have to stop calling for Israel’s destruction. They have to stop educating their people for Israel’s destruction. “Second, in any peace agreement, Israel must retain overriding security control over the entire area west of the Jordan River. Because if we don’t, we know what will happen – because otherwise we’ll get another radical Islamic terrorist state in the Palestinian areas exploding the peace, exploding the Middle East”. Some commentators may have viewed Netanyahu’s talk about not wanting to put labels on it as a way of him also backing away from a commitment to a two-state solution, but they would be wrong. The fact that Netanyahu would like to deal with substance is something that these declarations from certain countries prematurely recognising a Palestinian State are lacking. The fact is that what the Israelis and the Palestinians really need is substance. And they need decisive leadership to help any sort of peace deal. Which is why it is such as shame that while the media was so quick to jump on Trump’s statements about a two-state solution, it did not find it important to report on what Netanyahu said after that. On an international stage, with all of the world’s eyes on him, Netanyahu exposed the Palestinian Authority for their incitement to violence, and for the way they glorify terrorists, and all the world could do was scoff at President Trump. Netanyahu said: “Unfortunately, the Palestinians vehemently reject both prerequisites for peace. First, they continue to call for Israel’s destruction – inside their schools, inside their mosques, inside the textbooks. You have to read it to believe it… the Palestinians not only deny the past, they also poison the present. They name public squares in honour of mass murderers who murdered Israelis, and I have to say also murdered Americans. They fund – they pay monthly salaries to the families of murderers, like the family of the terrorist who killed Taylor Force, a wonderful young American, a West Point graduate, who was stabbed to death while visiting Israel”. It just a shame that while he was saying those things, nobody was listening. Meanwhile, PA Chairman Mahmoud Abbas used the opportunity to declare his “continuing commitment to the two-state option”. Of course, as noted above, one can never be sure if Abbas means to include Israel and the Jews as one of those two states. “If that will be the case, I will be running for the post of the Prime Minister and I can assure you that I will win over Bibi Netanyahu… We [Palestinians] will be more. All Palestinians will vote for me, and also some of the Israeli Jews. Netanyahu will be the loser”. While this would clearly show the democratic nature of Israel, Ahmad Tibi is certainly no lover of Jews and Israel, so his statements seem to me to be the most ringing endorsement of a two-state solution yet. If only it would be made clear that the two-state solution is one that follows the principles outlined in UNSC Resolution 181 which has always been accepted as establishing the basis of two states – one Jewish and one Arab.